Hey all, keeping this brief because I have the mother of all migraines and need to go lay face down in a dark room. The next batch is finished, except for adding the word balloons–obviously i added them for the update you’re reading now, but the 5 after it still need them. 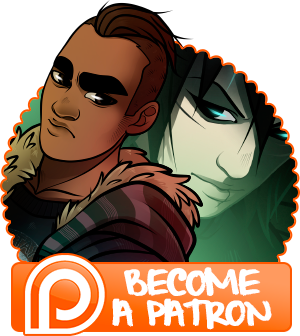 It’s the first thing on my list when I wake up today, and patrons will have access to all 5 not-yet-posted pages as soon as I wrap that up. Secondly, the winners of the poll have been announced, and you can access a breakdown of the results in the embedded tweet below. The short version is that readers will receive SFW Hallowe’en pinups featuring the winners, Muire (I’m pleasantly surprised!) and Henri. Patrons will receive all six wallpapers featuring all six winners in either SFW or NSFW versions depending on what tier they are. If you click the link in the embedded tweet below, you’ll get a larger look at the teaser images I posted. Cheers!